This entry was posted in Baseball and tagged baseball, kids, photography, Weekly Photo Challenge by Jackie, The Baseball Bloggess. Bookmark the permalink. Great stuff. Reading this made me think of my first Little League home run, tagging out the first girl Little Leaguer in Rhode Island trying to steal 3rd base and my one of my first trips to Fenway Park and meeting my idol, Jim Rice in 1976. Thank you. Thank you, Boston Randy! I love how baseball can stir so many of our own memories … especially when you see a kid out there playing, just all-in, and loving the game that we love, too. Though I don’t count myself a huge sports fan, strangely enough one of my strongest memories of eighth grade is playing softball with my female classmates. And even before that, I can still see my dad hitting softball pop ups to a group of us kids out in our yard. Baseball will always be with us as long as there are kids and a yard. As much as I love baseball, in my home of South Florida , I would more likely see a 4 year old with a soccer ball today. Oh this reminded me of a personal first – the new move to a bigger yard that was backed by a creek. Playing baseball in this huge yard and I smacked the ball all the way into the creek – and it sailed on downstream! Home Run in ‘my ballpark’! Came close a few more times but never achieved it again! Thanks for the memory walk! and that is why we love baseball! Thanks, Mark … I love how watching a kid play baseball connects us all with memories and our own stories. And, yes, baseball provides such a foundation for life, doesn’t it? What a beautiful post. I like to imagine the adult players as 4 year olds. I’m sure their parents remember well. :) It goes so fast. One day they are in a tiny pair of elastic waist band pants and the next day they are on the high school mound. :) Love this post. Thanks. Great post! 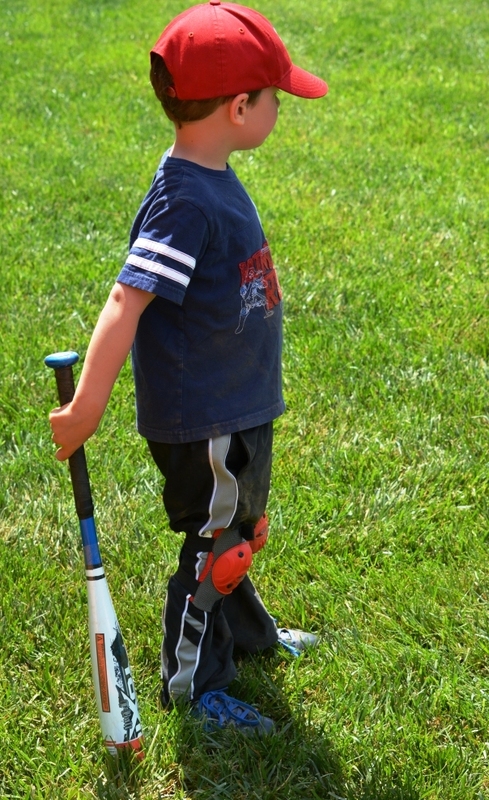 I treasure the days of my kids in tee ball and rookies. Time does fly by, and some of the innocence of the game gets lost. We try to keep it simple and fun, like Grant just playing with his dad. That’s the true beauty of the sport. 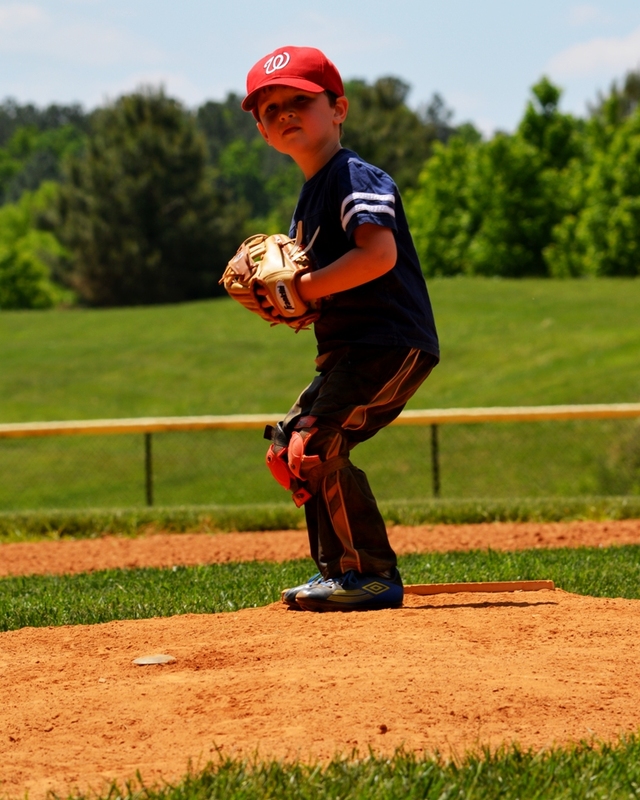 Having watched a few Little League games, I wish parents would remember that it is just a game and that it’s their kids playing it and trying to have fun. Some friends and I back in Minot loved to play the game but didn’t go out for the sponsored leagues. We’d find an open field and bring our bats and gloves. At one time, one of our baseballs lost its horsehide cover and we ended up wrapping the twine and rubber with black electrician’s tape, hardly a regulation baseball, but it lasted until it was launched into a wet construction ditch. It served us well. Thank you for the posting. I love that visual of kids just playing with a beat-up baseball in an open field … all you need is a little space, one old bat, and a ball that can be held together with twine, right? How cool is that! I used to love the game, played Little League for years. Gave it up when I moved to California and took up surfing (along with all those California girls the Beach Boys sang about). I like the quote from Cal Ripken, Jr. Get this, when I was in high school, I worked with Cal Ripken, Sr…when he was in the minor leagues, and worked in other fields during the winter. Cal Jr wasn’t even born yet. What about those O’s!! You worked with Cal, Sr.! Of course, I’m not surprised because you never cease to amaze me with all your travels and adventures and experiences. (And, Bhutan … sigh!) I’m touched that you took time out from your adverturizing to actually read one of my posts. Truly. O’s went 7-0. That was fun. BB…I’m back home now, and trying to catch up with not only posting about the trip, but more importantly reading and commenting on other blogs, which I did not do at all while gone. And also have been very poor at for a few weeks…or months now. Bad blogger, bad. But when I get around to it, I really like reading your blog…you’re fun. Are you in Baltimore? An O fan…or what? I’m in Virginia, about three hours away from Baltimore. I fell in love with the O’s when I was living in DC, there were no Nationals, and the Orioles started their season 0-21. If ever a team needed me, it was that one. They won shortly after I announced my decision to make them “my” team, which only proved how well-suited we were for each other. And, I’ve been waiting for a World Series ever since. So….you’re like a lucky charm, eh? Cool. Thanks, glad you like the posts, and share them…very cool…and you should go there! Great post. I really enjoyed it. I write a lot about baseball. If you have time, come by and visit my site. I would love to hear what you think. Best of luck with your site.